The Swing by Pierre-Auguste Renoir is on its last “swing” through the United States in connection with the Impressionism, Fashion & Modernity Exhibit at the Art Institute of Chicago (through September 29, 2013). It’s a beautiful painting to see up close, whether you catch in in Chicago or back in its home at the Musée d’Orsay in Paris. But it’s even more fun to climb onto the matching swing at the Musée Montmartre in Paris and indulge in a little reenactment of your own. If only I had found some blue bows and a couple of dapper admirers in a boater’s hats, I would have been all set. 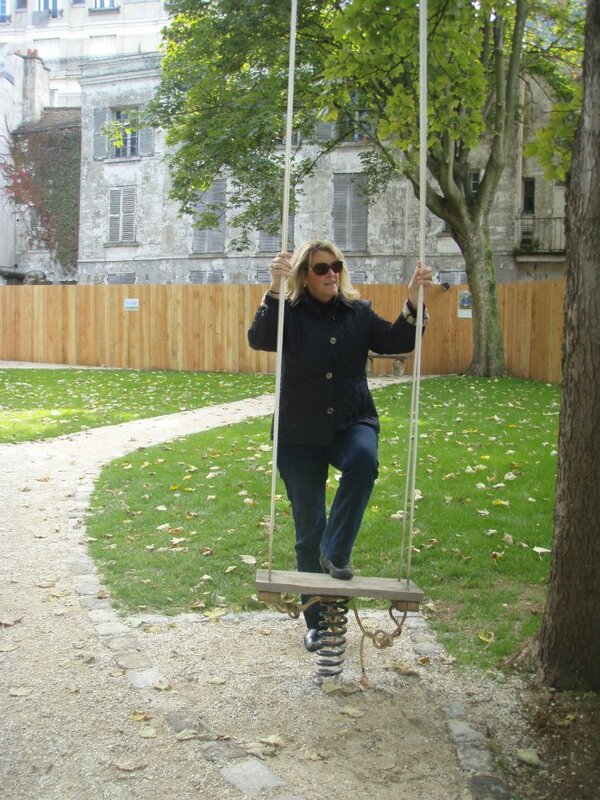 That’s me on the swing at the Musée Montmartre. Not the most flattering pose, and not the most fashionable ensemble, but a black turtleneck, jeans and black boots made up my daily Paris uniform in the cooler months. No bows, no corsets and no princess-cut muslim gown for me. 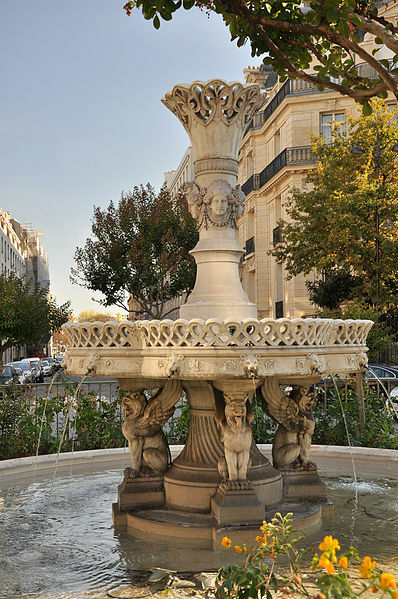 Museé Montmartre, 12-14 rue Cortot, Paris (18th). You should go! 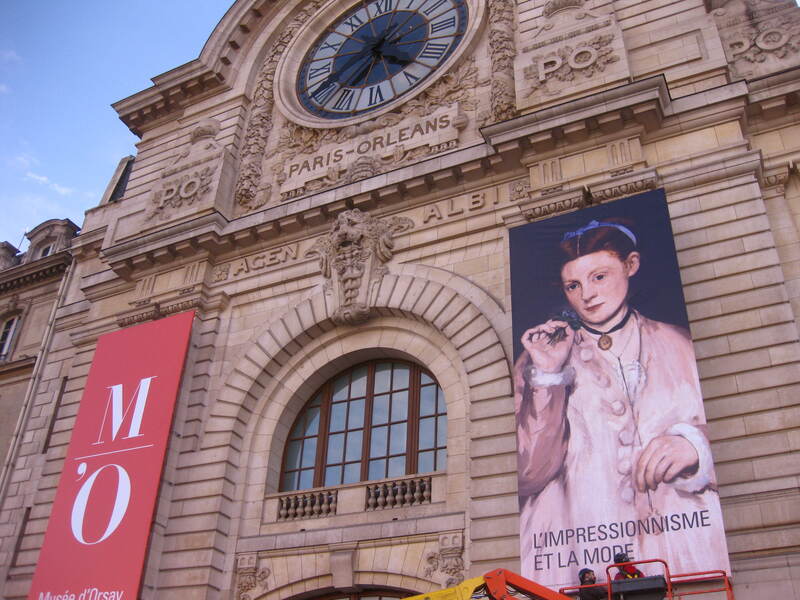 So, I have to admit I’m a little nuts about the Impressionism and Fashion Exhibit at the Musée d’Orsay. 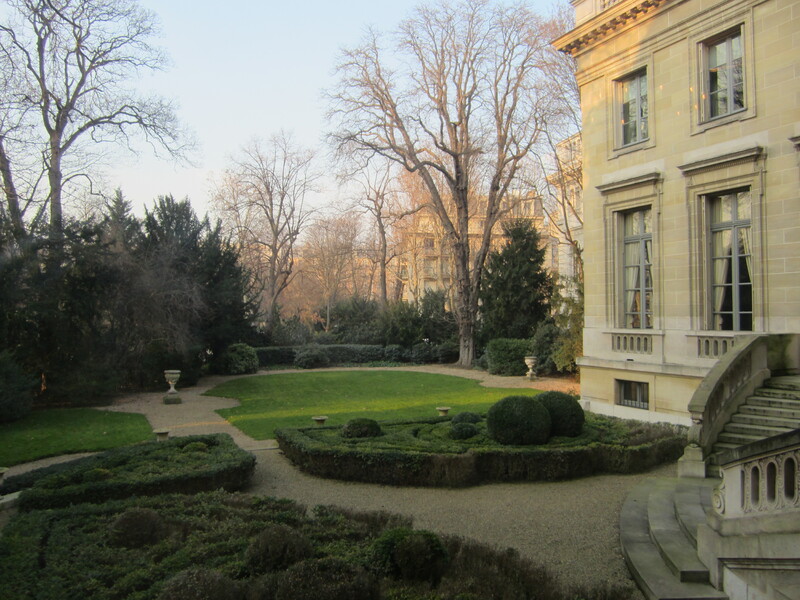 In my last months in Paris, I went four times. I had a lot of American visitors who wanted to go, but I truly did want to keep going back. Each time I found something new. One of my favorite rooms of the exhibit was the last room, decorated to look like a park. 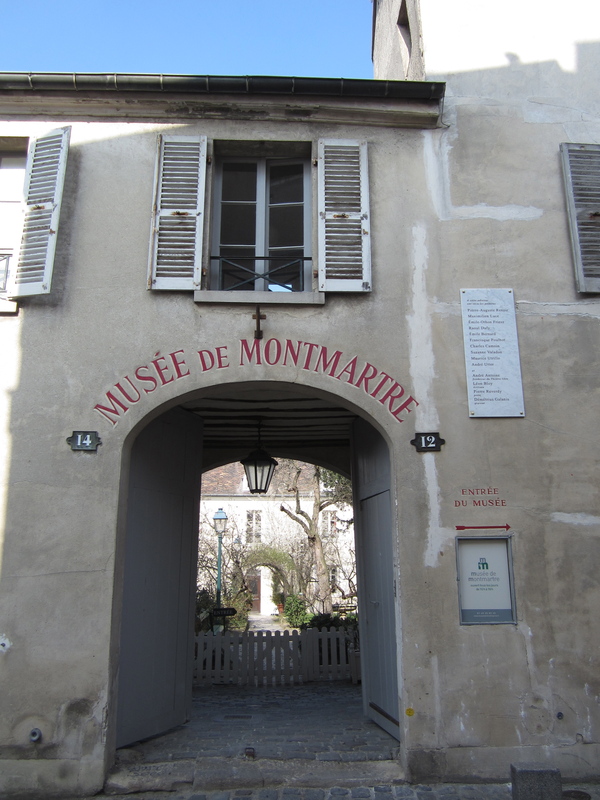 That’s where you could find Monet’s oversized plein air paintings with Camille in her huge, fabulous dresses. I grabbed my visitors, and said, that’s Camille! Like I knew her. But I kind of do. 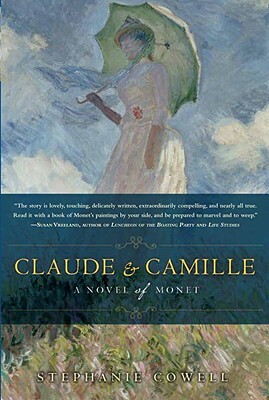 A couple of years ago, I read Claude and Camille: A Novel of Monet by Stephanie Cowell, and I even hosted Stephanie at a literary luncheon at the Downtown Glen Ellyn BookFest, an annual event sponsored by my local library and bookstore. 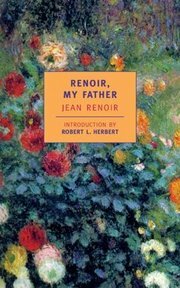 The book is all about Claude Monet and his first wife Camille. How they met, how she posed, where he painted. So when I saw this painting (below) at the exhibit, a study of Bazille and Camille (1865), on loan from the National Gallery of Art in Washington, D. C., I stopped and gaped. It was Camille and Bazille, shortly after she’d met Claude. 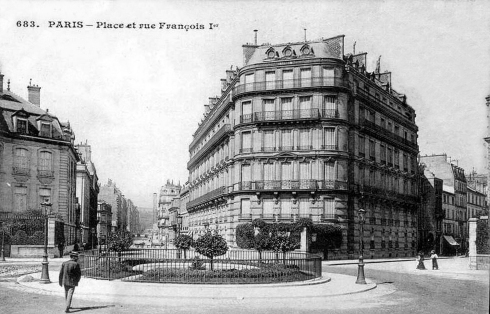 I’d read about their summer trip to Fountainbleu in Claude and Camille. How the 18 year-old Camille had snuck out of the house without her parents’ permission, bringing along her older sister as a chaperone. Claude Monet, Camille and Bazille (Study for Luncheon on the Grass) 1865. National Gallery of Art, Washington, D.C. This painting was just a study, painted quickly en plein air in the Fountainbleu Forest, but I think it’s almost better than the final painting, Luncheon on the Grass (1865-66), shown below. It feels fresh and immediate, as if you’re standing right there spying on this couple from the dappled shade behind the bushes. According to the article Fashion En Plein Air by Birgit Haase in the Exhibit Catalog, the dress that Camille is wearing would have been a highly fashionable outfit for women on trips to the countryside that year. Camille, who left her corset at home, is the perfect model for modern leisure wear in 1865. Monet obviously said yes to this dress – the embroidery, the cut and draping of the back of the dress and jacket seems to be the focus of the whole painting. After the summer in Fountainbleu, Monet went back to Paris with the plan of turning his small plein air studies into a bold large canvas suitable for the Paris Salon. He made all kinds of changes to the dresses and the poses, but was so dissatisfied that he abandoned the project. 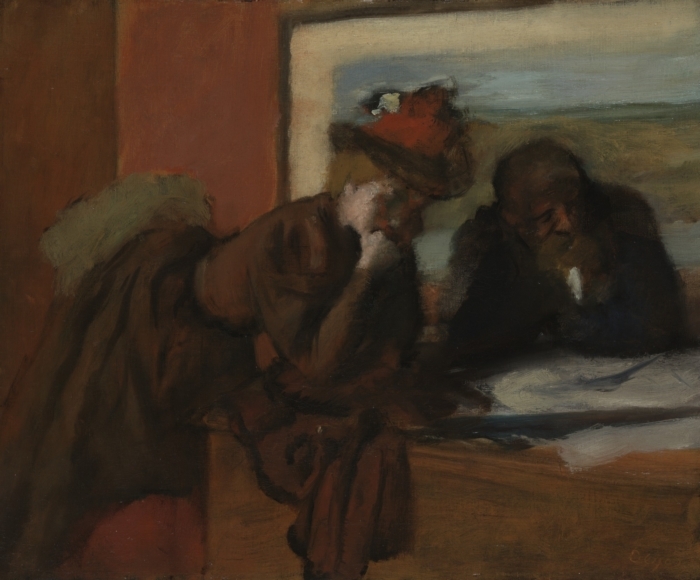 What is left of the final painting appears in two giant panels at the Musée d’Orsay. What he had seen so clearly on a summer’s day in the forest was not on the canvas before him. People were clumsily placed; the brushstrokes were all wrong. It had been repainted many times and he had never found the balance of human form and light, It was not a masterpiece at all. How could he not have seen it before? How could he have made such a mess of it? I had to pay my rent, I gave [Luncheon on the Grass] to the landlord as security and he rolled it up and put in the cellar. When I finally had enough money to get it back, as you can see, it had gone mouldy. Monet retrieved the painting in 1884 and cut it into separate panels. Two of the three panels have survived and are included in the Impressionism and Fashion Exhibit. After abandoning Luncheon of the Grass, Monet decided to ask Camille into pose again, this time in a green and black striped taffeta silk dress with an enormous train. Art historians don’t know exactly where this dress came from. They speculate that because of its sumptuous fabric and fur, it would have been beyond the financial means of either Monet or Camille. Stephanie Cowell imagines that Monet’s friend Bazille rented it for a painting of his own, and was willing to loan it to Monet. In fact, there is evidence to support Stephanie’s theory. In an 1866 letter to his mother, Bazille mentions a green satin dress that he had rented. Claude Monet. 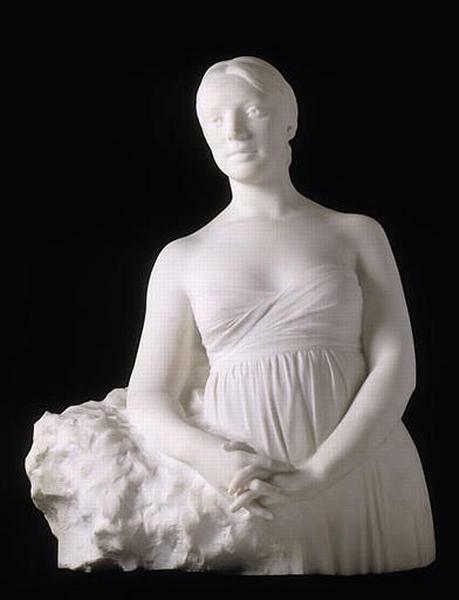 Camille (1866). 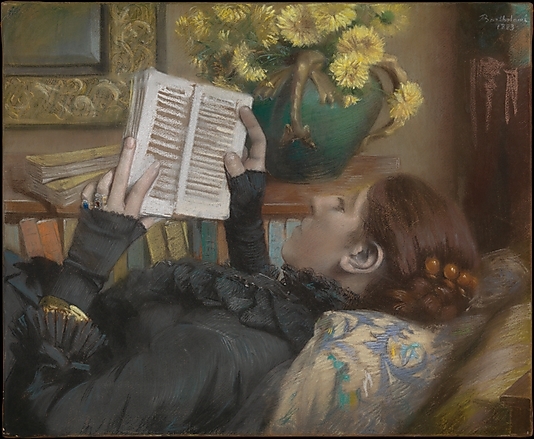 Kunsthalle Bremen, on loan to the Impressionism and Fashion Exhibit in New York and Chicago. Camille said yes to the dress. She added with a fur-trimmed jacket and empire hat, and posed as if she was heading out the door. Once again, she appeared to lack a corset, a sign of independence and modernity. Stephanie Cowell’s book goes on to describe the days that Monet spent in his studio, painting Camille in the green dress, the attraction between them building each day. 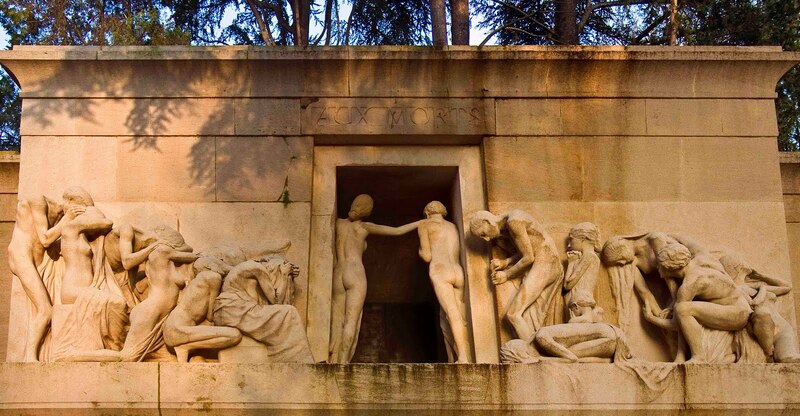 Claude and Camille would later marry over the strong objections of her parents. 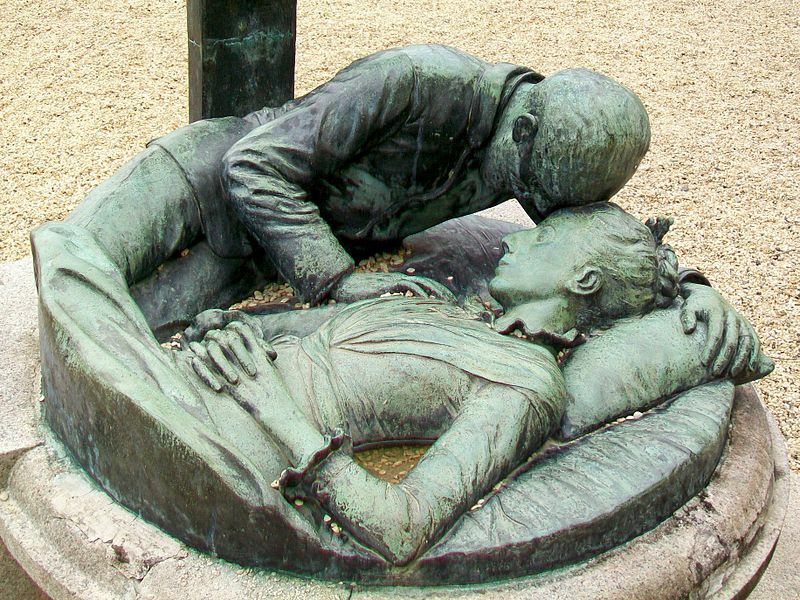 Camille died in 1879 at the age of 32. 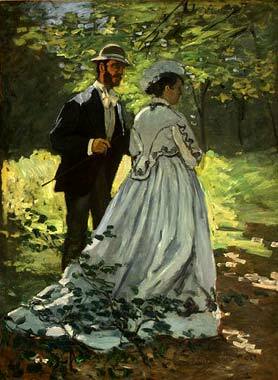 The painting would become known as Camille, The Green Dress (1866). It was accepted at the 1866 Salon. This painting did not appear in Paris, but it will travel to New York and Chicago as part of the Impressionism and Fashion Exhibit, along with a real green tafetta dress from 1865, thanks to the costume collection of the Manchester Gallery of Art in England. I can’t imagine a better book club pick than Claude and Camille, paired with a field trip to see the Impressionism and Fashion Exhibit at the Musée d’Orsay (September 25, 2012 – January 20, 2013), the Metropolitan Museum of New York (February 26- May 27, 2013) or the Art Institute of Chicago (June 26- September 22, 2013).